The Dark Knot Men's Tie & Accessory Set Giveaway Winner: Congratulations to Bruce F. of Antelope, CA, winner of the Dark Knot Men's Tie & Accessory Set. Thanks to all entrants, and be sure to check the Dude homepage or Dude Giveaways section for your chance to enter our latest prize drawing. This giveaway concluded on February 11, 2018. The Dark Knot is a men's tie and accessory retailer, a subscription service, and an online consultant the wants all men to "Be the best version of yourself." In other words, with The Dark Knot, dudes who are Before versions of Steve Carell in Crazy, Stupid, Love have the chance to get Gosling-ed into the After. Especially those who click here and enter to win a stylish set of men's ties, pocket squares, and tie bars from The Dark Knot! A $500+ value! This giveaway is open to all residents, US and international. Mezzegra Foulard Printed Silk Tie: Available in Regular or Extra Long, the Mezzegra Foulard is a printed silk tie hand made in Como, Italy. Its deep pink background is dotted with a light blue floral pattern. The tie is interlined with a layer of wool to give it additional substance for effortless draping, and a thicker knot. 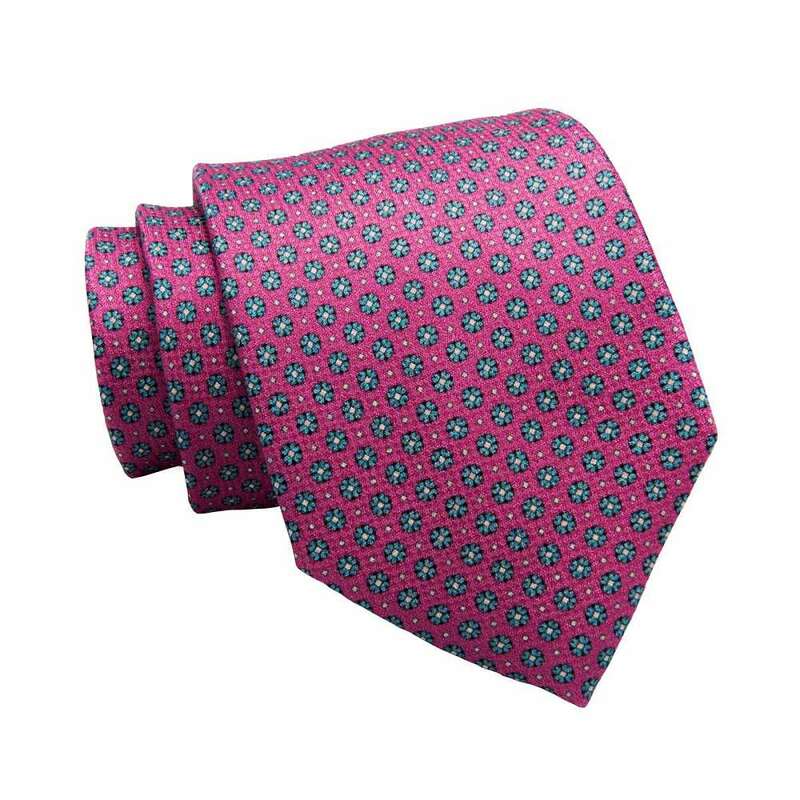 Brienno Foulard Printed Silk Tie: Also available in Regular or Extra Long, the Brienno Foulard is another Dark Knot Italian stallion, made of 100% printed silk in Como. It has a repeating red floral and diamond pattern set against a blue background. Ellington Paisley Pocket Square: 17" x 17" of 100% silk twill weave. Light blue and green paisley set off a blue background. The pocket square is finished with white hand-rolled contrasting edges. Mansfield Paisley Linen Pocket Square: Slightly smaller than the Ellington at 15" x 15", the Mansfield is a 100% linen square in a bluish purple paisley set against a lilac background. Its hand-rolled contrasting edges are pink. Suffolk Silver Stainless Steel Tie Bar: This 2-1/4" tie bar has a ridged surface and pinch clasp finishing. Norfolk Silver Stainless Steel Tie Bar: Slightly shorter than the Suffolk at 1.6", with a single hash running down the center in both directions. To register, click here and fill out the Dark Knot Men's Tie & Accessory Set Giveaway entry form. Or, if you're already a member of DudeIWantThat.com, when the magic entry form button appears, just click it to enter. 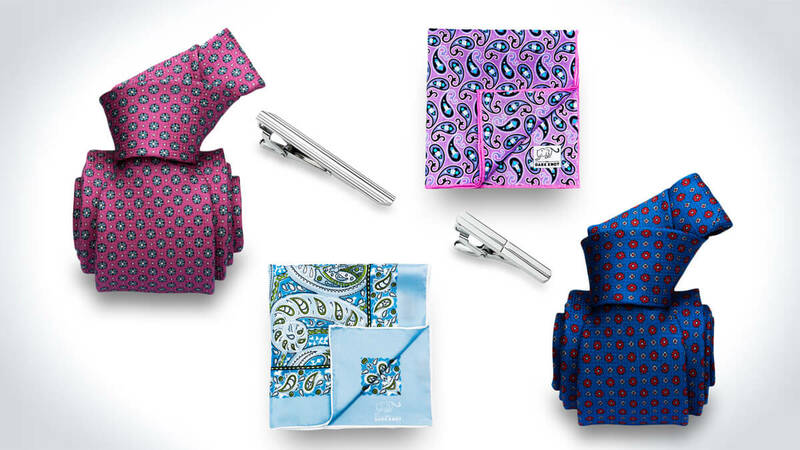 Giveaway prize includes: 1 x Mezzegra Foulard Printed Silk Tie in Pink / Light Blue ($175 value); 1 x Brienno Foulard Printed Silk Tie in Blue / Red ($175 value); 1 x Ellington Paisley Pocket Square ($39 value); 1 x Mansfield Paisley Linen Pocket Square ($39 Value); 1 x Suffolk Silver Stainless Steel Tie Bar ($40 Value); and 1 x Norfolk Silver Stainless Steel Tie Bar ($35 Value). Total prize package value is $503. Winner should allow up to 3 weeks for prize delivery. Once winners are drawn and confirmed, they will be announced above. 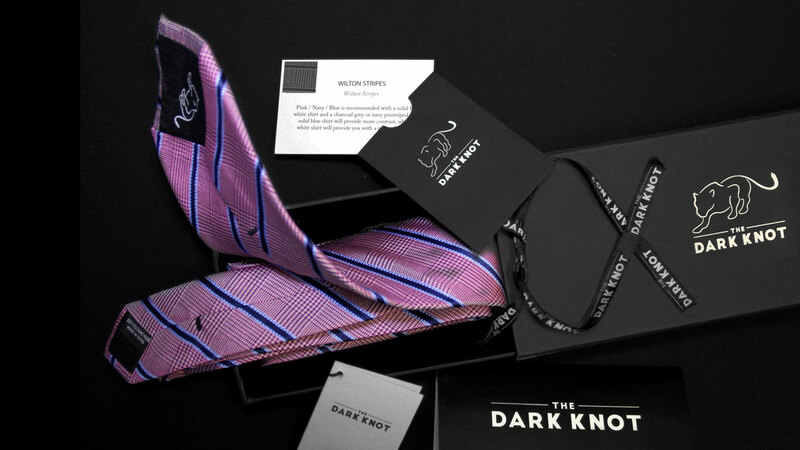 The Dark Knot sells all of its ties and accessories individually, or as part of a subscription service. Check out the entire collection here. And if you're looking for a gift for a man, know that Dark Knot orders arrive as they intend to make their recipient look: elegant. Accessories are packaged in a black gift box, and include a card with recommendations for matching suits and shirts.